We do not experience fear. But we understand how it affects you. That guy's got bearings of chrome steel. Robots are as varied as their creators. Occasionally, they're allies; in many others the opposite holds true. Regardless of their morality or design, robots often follow the Rule of Cool. Given the opportunity, many tread over the line from being merely "cool" to being completely Badass. All types of robots are covered under this trope, but an individual who is primarily human but possesses cybernetic or electronic implants doesn't count. The easiest test to determine whether or not a character belongs here is by observing if they have a mechanical "brain". If so, they're an Automaton. Father Tres from Trinity Blood. Nadia Armitage from Armitage III. Tachikomas. Miniature robotic spider tanks that often serve as fire support and comic relief. Cute, bubbly, and armed to the teeth. Big Damn Heroes who've laid down their lives to save Section 9 and countless others on more than one occasion. Chachamaru from Mahou Sensei Negima. The Tanakas also qualify, to a lesser extent. Depending on how stringently one chooses to remember their background, the Wolkenritter from Magical Girl Lyrical Nanoha. The show itself isn't fond of helping their case for Automaton-hood, except with Normally I Would Be Dead Now. Mobile Suit Gundam 00 Automatons of Season two which the Earth sphere Federation split mini-army of elite soldiers A-laws use on resistance group Katharon. Make many appearances in the middle and end of season two. Assistaroids in Asobi Ni Iku Yo are pure Badass Adorable when called to action. The "douji" in Karakuridouji Ultimo. ASIMO from The Legend of Koizumi. Mechazawa from Cromartie High School. J from Heat Guy J. The various Earth-built support robots in GaoGaiGar. All of them are Hot-Blooded and have awesome finishing moves, and all of them get to take down at least one Monster of the Week without Triple G's help. In Marvel Comics, the evil Ultron defines Badass Automaton. Also in Marvel, Machine Man, while originally a pacifist and nowadays a humorous cynic, certainly has his badass moments. One of these involved killing Ultron. Transformers comics are made out of this trope for about 98,6% (the rest is fleshies, whining). Wall-to-wall, 24/7 giant robots who have known nothing but cosmic war for millions of years. Not happy but most certainly badass. Atomic Robo goes around fighting mad scientists, giant spiders, ancient Egyptian robots, and a mad scientist dinosaur. Ultron's first creation, The Vision. Ultron designed him to be as Badass as possible, which backfired when Vision defected to the Avengers. The Livewires are a covert group of Badass Automatons. The various Terminator iterations throughout the series of the same name. R2-D2, who doubles as a Badass Adorable. Pretty much any bounty hunting or assassin droid from the Expanded Universe. Sonny from I Robot, though most robots in the film could arguably qualify. V.I.N.Cent from The Black Hole. Killer Robot Maximillian is a villainous example. "I am NOT a gun!" Werther in Guest From the Future. Jean-Bot from Ultraman Zero: The Revenge of Belial. Later, the Direct to Video sequel introduced his "younger brother" Jean-9. Keith Laumer's Bolos, a kind of artificially-intelligent supertank. Quintus, a.k.a Daedalus. Basically, the automaton created himself. Also, Festus the Bronze Dragon. Erek the Chee during his brief period of reprogramming, in "The Android" in Animorphs. He takes out a bunch of human and Hork-Bajir controllers single handedly, before rescuing the group—and then having an epic My God, What Have I Done? moment. Data from Star Trek: The Next Generation. He could destroy stuff with his bare hands and Worf said that he was one of the few people who could easily hurt the Klingon. Evil aliens on Doctor Who and The Sarah Jane Adventures really ought to have learned by now that it is a bad idea to ignore the goofy-looking metal dog. Then again, most of them don't usually live long enough to underestimate K-9 a second time. Rory Williams-Pond went through a 2,000 year stint as a plastic gun-wielding plastic robot. This has only served to up his badass levels. Smallville's Brainaic combines this trope with Badass Bookworm, Badass Teacher, and an utter lack of morality for frightening results. Janperson and Gun-Gibson from Tokusou Robo Janperson. The original version of Golems. Talos, the guardian of the harbor at Rhodes, was according to legend a colossal example. Warhammer 40,000 has the Necrons, an entire race of (mostly) humanoid automatons made of regenerative metal. They carry theoretically impossible molecular flaying energy weapons capable of PEELING TANKS and can put themselves back together after being ripped limb from limb, cut in half with monomolecular weapons, blown apart by tank shells or else something suitably horrific. They, if somehow killed, are teleported back to their underground complexes where they are rebuilt and sent back out. They were once living before having their SOULS placed in robots by SOUL-EATING PURE-ENERGY ELDRITCH ABOMINATIONS, which they now serve. Netland's New Universal Killing Machine. Although he just got nuked. Cronus, the machine NUKM was built to destroy, is also an example. Legion (the image above and inspiration for this trope) and EDI in Mass Effect 2. 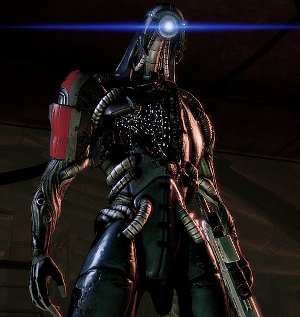 The Reapers are villainous examples. T3-M3 may not be as combat capable as HK-47, but it makes up for it by single handily saving the Ebon Hawk and its crew in the opening of Knights of the Old Republic II. It also can keep secrest, and its implied only it knows what happened to Revan since the events of the first game. Shale, the 8000 pound golem in Dragon Age. And SWTOR adds T7-01, a naive R2 and the first companion of the Jedi Knight, and M1-4X who enthusiastically joins the trooper's Havoc Squad. As well as SCORPIO, who is basically GLaDOS in a shiny Metropolis body. Cain in Binary Domain. Both The Smart Guy of the Rust Team and a total badass. Cave Story: Curly Brace and the protagonist are not just badass, but Badass Adorable. The vast majority of Mega Man characters. Mega Man 2's Air Man in particular gets Memetic Badass status, with his own song to boot. Most Blue Bombers start out as utility servants and later Take A Level. Mega Man X and his partner, Zero, come off the workbenches with that level already built in. Clay 13 from The Spirit Engine 2. Aigis from Persona 3, who (to some fans) also counts as Badass Adorable. Metal Sonic and E-123 Omega of Sonic the Hedgehog. The former for being Sonic's unhinged evil counterpart and the latter for the insane amount of weapons and the speed to keep up with the rest of the cast. E-123 Omega is pretty crazy himself, and E-102 Gamma from the Sonic Adventure is an Iron Woobie along with this trope. Guillo from Baten Kaitos Origins. More or less the entire population of Cybertron. In more or less every incarnation, no less. But Transformers: War for Cybertron takes the cake. The original CHAS from Roughnecks: Starship Troopers Chronicles. His descendants seem to have taken a level in wimp, though. This page was last edited on 9 April 2017, at 09:45.